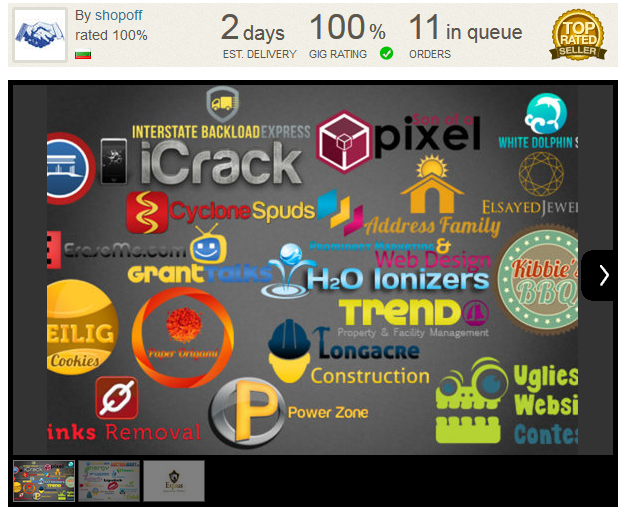 Level 1 sellers have been active on the site for 30 days and completed at least 10 orders while maintaining excellent ratings and a great track record. Level 2 sellers have made over 50 orders in the past two months while maintaining excellent ratings and a solid track record. - Fiverr Gig rating is based off of user feedback, most Fiverr sellers are very protective of their user rating so you won’t see a lot that are low. Scrolling down and reading the feedback that led to this score is going to be more telling than the numbers themselves. Be aware that fake positive feedback is always a possibility with any kind of site that uses customer reviews, but you should also be aware that fake negative reviews aren’t unheard of either. I understand Fiverr Customer Service does a good job dealing with these but you can’t catch everything so look out for anything that looks too fishy either way. - Orders in queue tell you how many people are ahead of you in line, a large number could mean a reduced chance of getting your gig completed early but it’s also a good sign that people like the product. - You can also click their user name and see when the last time they were on Fiverr was, if it’s been a while you might want to look elsewhere. I know that you have been thinking to yourself – “I really wish I could find someone to juggle a chainsaw and yell out my slogan”. 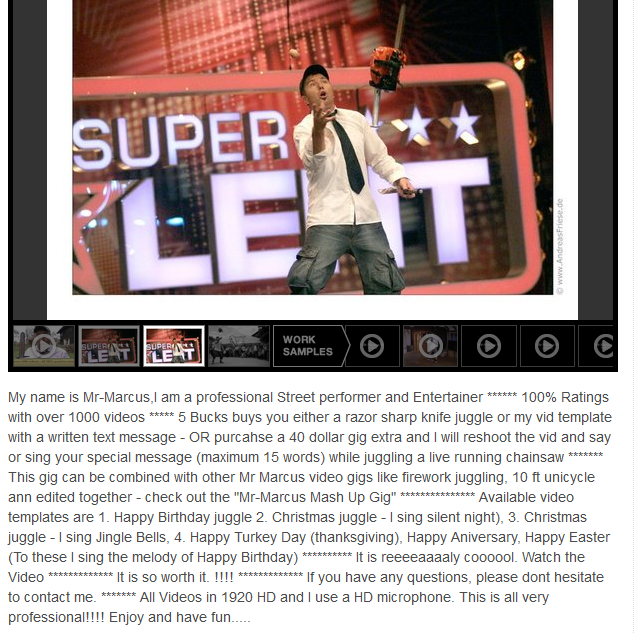 I think you’re weird, but it turns out Fiverr can help you out, your search is going to turn up Mr. Marcus, but you need to read the Gig title and and description very carefully so you know what you are buying and what is an extra. Also, how would you know how professional the chainsaw juggling it is, if you didn’t read it in the description?!? If a seller you are interested in doesn’t have samples, then make use of the ‘Contact Seller’ link right under the Buy Now button and ask to see some. When you purchase a Gig you are going to need to work with your seller so they know what you want, it’s your job to go over and above in answering any questions they have. Let me repeat this – they are working for $5 (less since Fiverr has to get paid too) and that means you need to give them all the information they ask for and then go a step beyond! Answer every question they ask you in detail, link to things you like, explain why, link to things you don’t like, explain why. I’m not saying write an essay or to micromanage, but if you want someone to do quality work for you for $5 then you have to put some time and effort into it too. Sellers do not want that negative feedback and they do want happy return customers so if you didn’t get exactly what you wanted then go back and re-try tip 4 and let the seller know what’s wrong and give them a chance to fix it before you leave any negative feedback. I hope these tips were helpful, and I’d love you to leave your own in the comments below! If you’ve found this helpful then please sign up for Fiverr though this affiliate link, it will help support the site and everything you buy will still be $5! My experience as a tarot reader on Fiverr. I’ve been looking into ways to exercise more and something that has always caught my attention are Exercise Desks, things like Bike Desks and Treadmill Desks that let you look burn calories when you would normally be sitting in a chair. There has been a lot in the news about the health risks of too much sitting and as I dig into the subject of exercise desks I’m finding that there is a lot of research on the benefits of extra activity during the work day. I was unable to find a good centralized information resource so I’ve decided to make my own and to see if I can pay for it with affiliate links to the various equipment choices. 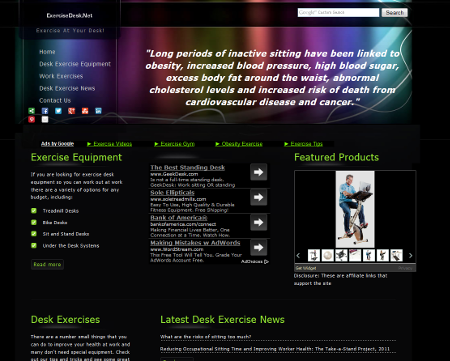 It’s still under construction, but I’m happy to announce the launch of the newest Knetwork site – ExerciseDesk.net! I’m using this as a chance to expand my knowledge of site building and affiliate marketing techniques, and I still have a lot of content to add, but it’s a start and I hope you’ll drop by! Friday March 4th is the first annual DSUNFSJB Day! 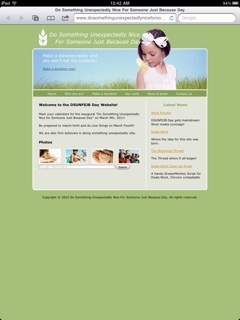 Born from the boredom and creativity of the deals.woot community combined with my love of made up holidays and a need to create an unforgivably long domain name, Friday March 4th marks the first annual Do Something Unexpectedly Nice For Someone Just Because Day. The name speaks for itself so the website doesn’t have to, freeing me up to have a little extra fun. I hope you will enjoy it and I hope you will try to do something unexpectedly nice on Friday well! March forth on March fourth and do good things!